David Willey's Transport blog: What chance an Ayrshire timber freight network? 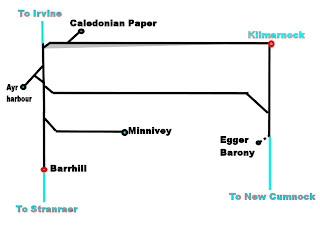 Several years ago, there was a proposal to create a timber loading point at Barrhill on the Ayr to Stranraer line. However, the promoters pulled out and the project never went ahead. But that got me thinking, there are a number of timber suppliers and customers in Ayrshire that are rail connected, but do not use rail transport. Timber from the Mull of Kintyre and Arran comes ashore in Ayr (which is rail connected) and Troon (which is not). Why can't the timber that is offloaded in Ayr be forwarded by rail? Then there is the Caledonian paper mill in Irvine, which receives china clay by rail, but not wood. And the Barony chipboard factory, which is located near a railway (it sits on top of the former branch to Barony colliery) but isn't connected to it.Another potential rail loading point is at Minnivey colliery, the former home of the Scottish Industrial Railway Centre, on the edge of the Galloway forest park. Put together, these locations could form the nodes of a transport network that could take potentially hundreds of lorries off Ayrshire's roads. To illustrate, I have drawn the map below. Relevant locations are in black. 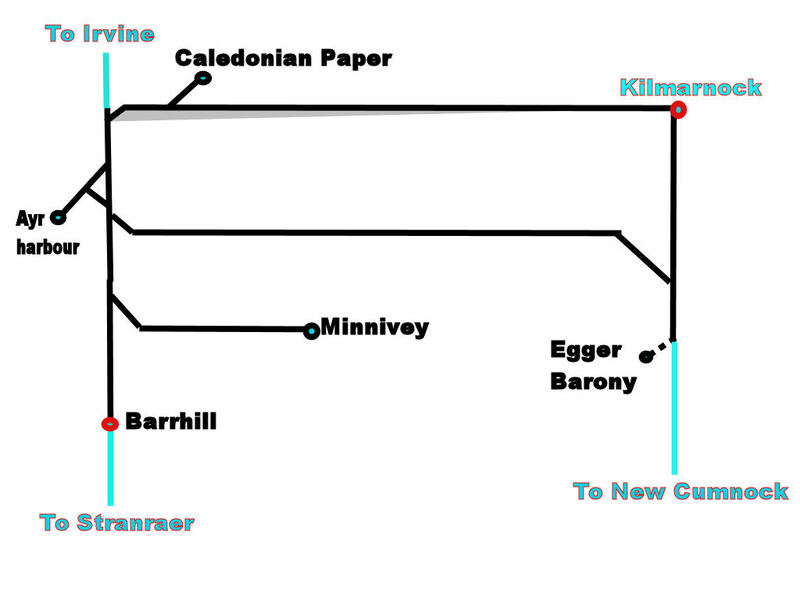 Connections to the rest of the railway network are shown in blue.